James Graham, Marquis of Montrose had been appointed as Captain General of Royalist forces in Scotland in Summer 1644. After a successful raid on Aberdeen, he initiated a war of attrition against Archibald Campbell, Marquis of Argyll culminating in the Battle of Inverlochy in February 1645. Marching his men across the frozen foothills of Ben Nevis, Graham surprised and defeated his rival. In August 1643 the Scottish Government and English Parliament signed the Solemn League and Covenant resulting in Scotland entering the war against King Charles I. In response the King appointed James Graham, Marquis of Montrose as Captain General of Royalist forces in Scotland. Although he had fought as a Covenanter commander during the Bishops War, he had opposed the subsequent power of the Presbyterian leadership under Archibald Campbell, Marquis of Argyll. 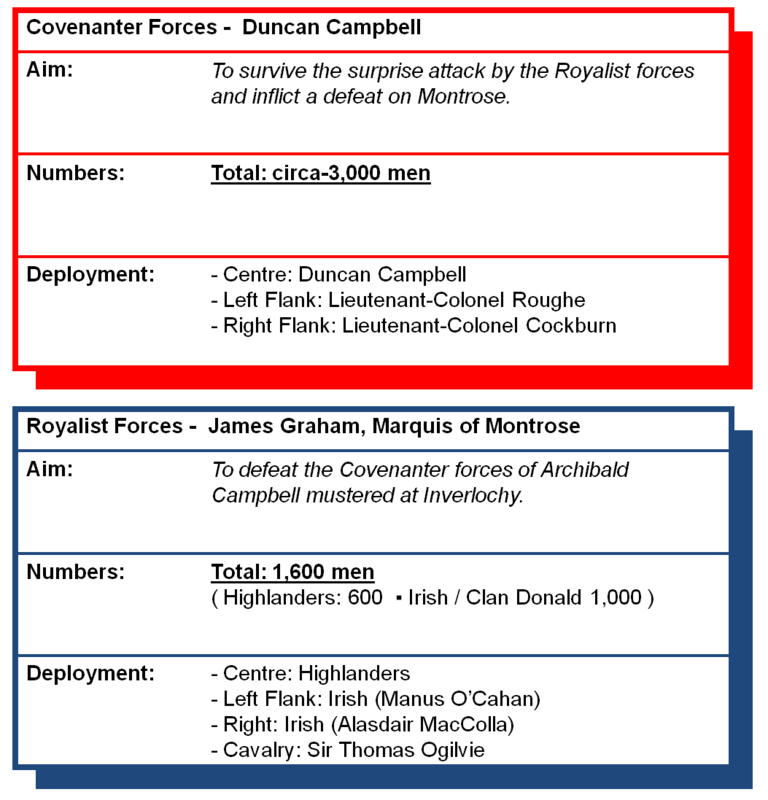 Montrose effectively mobilised the Highland forces, many of whom were opposed to Campbell, and achieved a number of rapid successes including victory at the Battle of Tippermuir (1 September 1644) and an assault on Aberdeen in October. 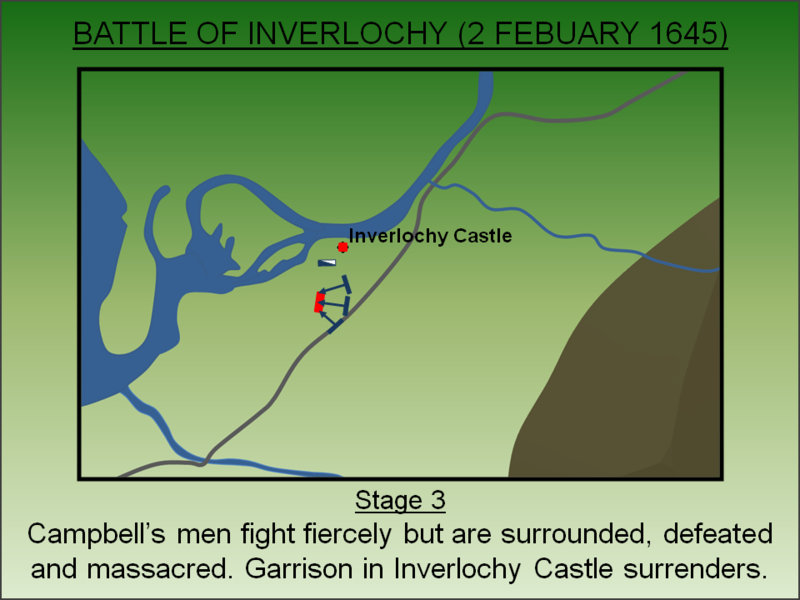 During late 1644/early 1645 Montrose waged a war of attrition against the heartlands of Archibald Campbell, Marquis of Argyll culminating in an attack on Inverary, seat of the Campbells, on the 14 January 1645. Montrose then moved his forces to Kilcummin (now named Fort Augustus) and intended to march north-east along the Great Glen towards Inverness where Covenanter forces were mustering. However, he then became aware of a second Covenanter army at Inverlochy headed by Argyll himself. An advance north was inconceivable with such a force on his back and therefore he resolved to engage. The Covenanter forces consisted of men drawn from Campbell's territories within Argyll and also veteran troops drawn from the Scottish army fighting in England most of whom were lowlanders. The Royalists had a core of Highlanders but their numbers were being depleted as many returned home laden with the loot they had acquired from the raided Campbell territories. However Montrose also had a large contingent of Irish, headed by General Alasdair MacColla, who had joined with the Royalist force in November 1644. The Great Glen, that runs between Inverness and Fort William/Inverlochy, has always been a main communication artery through the otherwise impenetrable Highland massif. Montrose was well aware that any advance along the Glen would have alerted Argyll to his presence and so he diverted his men from the traditional routes and moved towards Inverlochy through the foothills of Ben Nevis. Marching 30 miles in just 36 hours - over frozen and mountainous terrain, his force descended down the slopes of Ben Nevis just before dawn on the 2 February 1645. Although the Covenanters were aware a small Royalist force was in the area, they had no idea it was Montrose's entire army and were caught entirely by surprise. Panic ensued and Argyll himself, who was suffering from a dislocated shoulder, fled to his Galley leaving Duncan Campbell of Auchinbreck to command the army. He hastily deployed his men in a line extending south-east from Inverlochy Castle and garrisoned that old structure with 200 musketeers to anchor his left flank. Montrose extended his line to match but his reduced numbers meant his ranks were just two men deep. Initial skirmishes between the two forces commenced. Montrose attacked before dawn. The Royalists fired a single volley and then charged into hand-to-hand combat. This furious assault caused a strategic shock that resulted in the lowlanders on both flanks breaking. 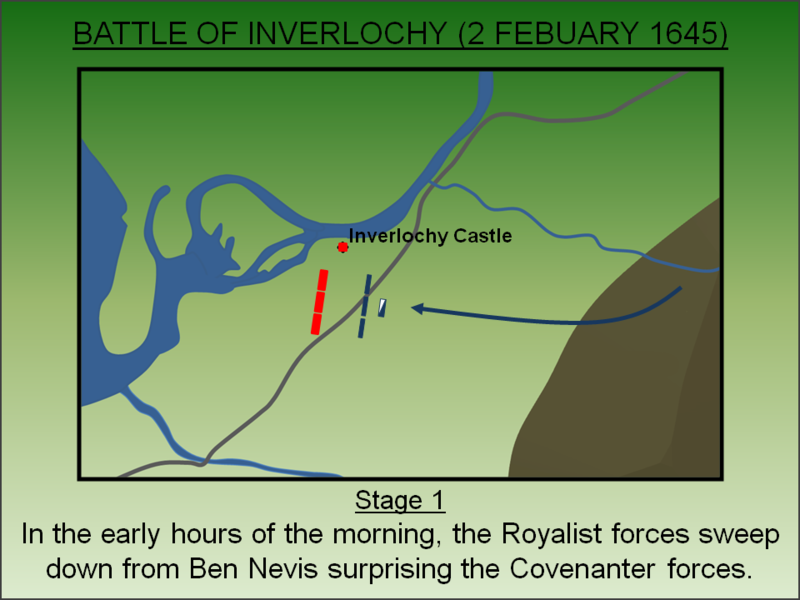 A detachment attempted to make for the safety of Inverlochy Castle but their retreat was intercepted by the Royalist cavalry under Sir Thomas Ogilvie (who received a fatal wound during this encounter). Despite seeing their flanks collapse and now being surrounded, the Covenanter centre held their ground - doubtless they knew what fate awaited them if they surrendered to their arch enemies of Clan Donald. Fierce fighting ensued in which the Covenanter commander, Duncan Campbell, was killed. The Covenanters were eventually overwhelmed and broke with mass slaughter ensuing - the death toll might have been as high as 1,500. With the Covenanter army scattered, the small force of musketeers garrisoning Inverlochy Castle surrendered to Montrose. Argyll slipped away to sea in his Galley. The victory led to significant recruitment into the Royalist ranks - members of Clan Donald flocked to the Royal standard whilst George, Lord Gordon joined bringing a significant cavalry element. Montrose now had a credible force that would see him achieve further victories at the Battles of Auldearn (May 1645), Alford (July 1645) and Kilsyth (August 1645). Following the latter he briefly became master of Scotland summoning a Parliament in Glasgow. However, it was not to last - Major General Sir David Leslie was ordered to return from England and in September 1645 he cornered the Marquis near Selkirk where the Royalists were defeated at the Battle of Philiphaugh. The battlefield is significantly different from 1645 with more trees and better drainage. Nevertheless the view of Ben Nevis and its foothills clearly shows the scale of Graham's achievement. A small cairn marks the battlefield and any visit should be paired with the adjacent Inverlochy Castle. The best place to start exploring the battlefield is from Inverlochy Castle. This is sign-posted off the A82 and has a small (free) car park immediately adjacent. The battlefield cairn is a short walk from the castle and the site of the 1431 battle is also nearby.